Last year, I was really impressed while listening to the debut Sunrise In Eden by Edenbridge from Austria. Although I'm normally not a fan of bombastic epic Metal à la Edguy, Sunrise In Eden got often played in my CD player. 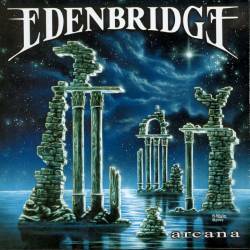 One year later, Edenbridge release their second CD called Arcana and my first impression was very positive. After several listenings, I dare say that they have even developped further. Band leader Lanvall (who also released three esoteric solo albums) shows that he belongs to the best guitar players in the whole metal scene. But Edenbridge's main attraction is the female singer Sabine Edelsbacher. She's not only very beautiful, but her angelic and calm voice is going under the skin. The album is also taking profit from a clear and bombastic production. Diversification is not a problem for Edenbridge. You find fast songs like Starlight Reverie, the grooving The Palace (my personal favourite) and even some ballads (A Moment Of Time, Winter Winds). Edenbridge are still a great progressive and bombastic Metal band. Maybe they are a kind of Dream Theater with female vocals.